27 June 1914: Entered the Army as a Fahnenjunker in the Lauenburgisches Fußartillerie-Regiment Nr.20. 5 August 1914: Transferred to the field with Foot Artillery Regiment 20. 9 November 1915: Transferred to the Replacement Battalion of Foot Artillery Regiment 20. 6 January 1916: Transferred to the II. Battalion of Foot Artillery Regiment 20. 20 August 1917-10 September 1917: At the same time, detached as an Ordnance Officer to the staff of Foot Artillery Regiment 20. 25 October 1917: Transferred to the regimental staff of Foot Artillery Regiment 20. 20 November 1917: Detached as a Static Officer to the staff of Artillery Commander 4. 3 December 1917: Detached to the staff of Artillery Commander 116. 21 December 1917: Assigned as the Artillery Communications Officer of the General Command of the XIV Army Corps. 10 May 1918: At the same time, served as the Regimental Adjutant of Foot Artillery Regiment 20. 21 March 1919: Transferred to Volunteer Heavy Artillery Battalion 20. 9 April 1919: Transferred to the 2nd Battery of the Reichswehr Heavy Artillery Regiment 9. 27 August 1919: Transferred to the 3rd Battery of Reichswehr Light Artillery Regiment 9. 19 November 1919: Transferred to the staff of the I. Battalion of Light Artillery Regiment 9. 17 April 1920: Transferred to Heavy Artillery Battalion 1. 1 October 1920: Transferred to the staff of the 2nd (Prussian) Artillery Regiment. 1 November 1924: Transferred to the Leader Assistant Course with the staff of the 2nd Division. 1 October 1926: Transferred to the 4th Battery of the 2nd (Prussian) Artillery Regiment. 1 October 1927: Transferred to the 5th Battery of the 2nd (Prussian) Artillery Regiment. 22 October 1928-1 December 1928: Detached to the Firing Course for Artillery Officers at the Münster Troop Training Area. 1 February 1929: Transferred to the 4th Battery of the 2nd (Prussian) Artillery Regiment. 1 October 1929: Transferred to the staff of the II. Battalion of the 2nd (Prussian) Artillery Regiment. 1 February 1930: Chief of the 5th Battery of the 2nd (Prussian) Artillery Regiment. 9 December 1931-15 December 1931: Detached to Gas Protection Course C in Berlin. 15 October 1935: Commander of the II. Battalion of Artillery Regiment 56. 13 June 1938-30 July 1938: At the same time, delegated with the leadership of the Weapons School Course for Senior Officer Cadets. 1 June 1939: Detached to Inspectorate 4 of the Army High Command. 26 August 1939: Commander of Artillery Regimental Staff 619. 1 October 1939: Staff Officer for Artillery in the General Staff of Army Group A. 25 October 1939: Chief of Staff of the General of Artillery in the Army High Command. 20 October 1942: Army High Command Leader Reserve. 12 November 1943: Army High Command Leader Reserve. 27 December 1943-February 1944: Commander of the 156th Reserve Division in Belgium. February 1944-30 July 1944: Commander of the 47th Infantry Division in France. 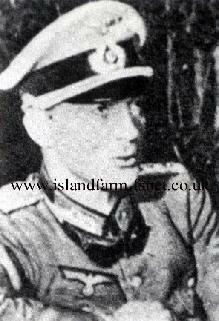 20 August 1944-20 January 1948: Prisoner of war in British captivity. 23 August 1944 transferred to Trent Park Camp 11 sorting camp..
14 January 1948 transferred to Camp 157 for repatriation. German Cross in Gold: 17 November 1943, Generalleutnant, Commander of the 302nd Infantry Division. Generalleutnant Elfeldt relinquished command of the 47th Infantry Division to Generalmajor Carl Wahle. On 4 September 1944, Generalmajor Wahle was captured by U.S. troops when the remnants of his division attempted to break out of the Mons Pocket. Wahle was later held as a prisoner of war at Island Farm Special Camp No. 11. Generalleutnant Dietrich von Choltitz relinquished command of the LXXXIV Army Corps to Generalleutnant Elfeldt. Later promoted to General der Infanterie, von Choltitz was appointed Commanding General and Armed Forces Commander of Greater Paris. Although directed by Hitler to turn Paris “into a field of ruins,” von Choltitz ignored the order and surrendered the capital to the French forces of General Charles de Gaulle on 25 August 1944.